Relic Series is utterly unique in the world of jewelry boxes. All Relic boxes are crafted from reclaimed wood. Gorgeous to the eye and one-of-a-kind, these boxes are exquisite accent pieces or conversation starters that will highlight any room. The Old Dominion is simply stunning. 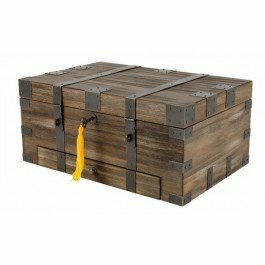 Crafted of reclaimed solid pine wood, and decorated in rustic metal hardware, this extra-large, vintage-inspired box is simply astonishing. The interior is fully-lined in cocoa-colored velvet, with quadrant hinges, lift-out tray, large main compartment, pull-out drawer, 4 pendant hooks, and mirror on inside lid. Lock and key. Features: Vintage inspired, reclaimed solid pine wood construction Cocoa velvet-lined interior Large main compartment Lift-out tray and pull-out drawer Rustic metal hardware Mirror inside lid Quadrant hinges Lock and key Drawer made of wood fiber Dimensions: 15.75"x10.63"x7.1"
If you have any questions about this product by Relic Series, contact us by completing and submitting the form below. If you are looking for a specif part number, please include it with your message.